I decided to buy an 8-pound tub of butter from South Mountain Creamery. I usually buy butter from Costco in 4-lb packages (each stick is a quarter pound, 4 sticks of butter in a box, 4 boxes in a Costco pack), so I don’t mind having butter around in bulk; it freezes very well. And with constant baking (two sticks of butter in a batch of cookies, or one stick in a loaf of banana bread), as well as constant cooking (virtually every time I heat a pan to saute something, I usually start with a pat of butter and a glug of olive oil), butter disappears from my household at a fairly regular rate. So, back to the 8-pound tub. Compared to Costco prices, it’s not actually a very good deal; Costco will sell you 4 lbs of butter for $11.50, so that’s $23 for 8 lbs, whereas South Mountain Creamery charges $27.69, plus extra if you’re having it delivered. But it’s from a small operation, from sustainably-raised cows on a local farm, so some markup is not unexpected. An awesome friend of mine has a recurring delivery from South Mountain, and kindly agreed to add my tub of butter to her weekly delivery, so I did at least save on the delivery fee. It was pretty intimidating to be faced with this giant tub of butter. But I wasn’t about to freeze the whole thing in a solid block, so I got out a couple of tablespoons, my kitchen scale, and some plastic wrap, and got down to business. I figured the best way to portion the butter was in the form I was already familiar with: the standard “stick” of butter, 4 oz each (or 1/4 lb). 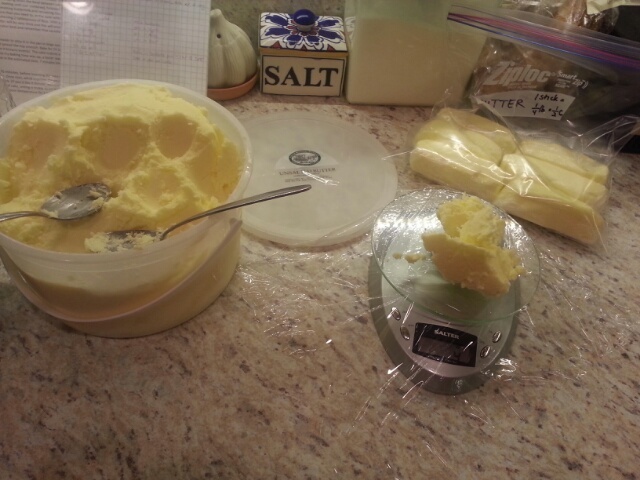 I set the kitchen scale to ounces, put a piece of plastic wrap on top, and started spooning out chunks of butter. Whenever I had added and subtracted enough butter to equal 4 oz, I wrapped the 4 oz of butter up in plastic wrap and started squishing it into a vaguely rectangular shape, using my phone and the counter surface. The process started to speed up as I got a better feel for how much butter would be in each 4 oz batch. 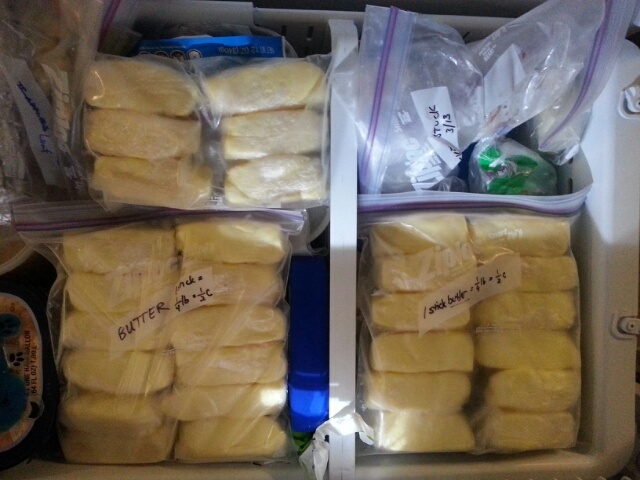 I ended up getting 30 sticks of butter, plus a bit extra (less than 2 oz) that I stuck in the fridge for later. Here are the sticks in the freezer, all wrapped up and bagged. I know, right? Only 30 sticks? I had been expecting 32. (Because 30 sticks of 4 oz each actually comes to only 30 x 4 = 120 oz, and 120 / 16 = 7.5 pounds of butter, which is a half pound less than the 8 lb advertised.) I weighed the butter again after I had made it into sticks, just to make sure that I hadn’t messed up during the portioning process, but all of it still came to about 7.5 lbs. I’m kind of disappointed that I didn’t get my full 8 pounds of butter, but on the other hand, this is more butter than I’ve ever had in my freezer at once, so it feels silly to complain. Week 10 was a doozy. It took up most of our kitchen table. 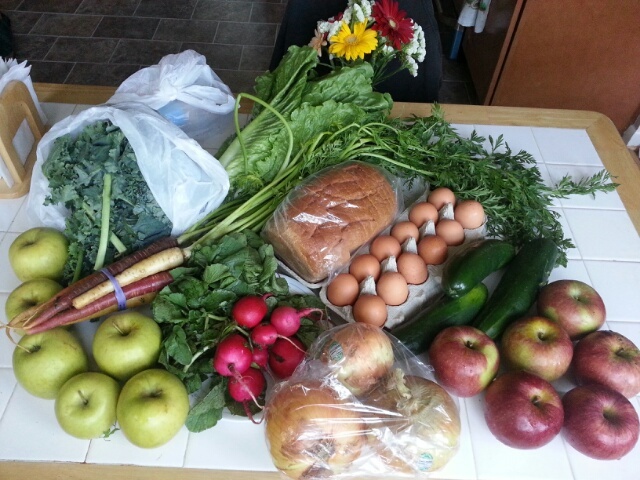 We got kale, two shares of apples, a bunch of rainbow carrots, a head of Romaine lettuce, a bunch of radishes, three Vidalia onions, cucumbers, eggs, and bread (Great Harvest honey wheat). The honey wheat was perfectly decent. I would ordinarily go for a more adventurous type of bread, but alas, if you get to the pickup site five minutes before closing, your bread choices are pretty picked-over. I don’t blame my fellow Miller Library CSA members — I go for the interesting breads first myself. This week maybe I’ll get there in time to get the Great Harvest parmesan sourdough, if they have it. Oh parmesan sourdough, tangy and chewy and shot through with rich veins of cheesy goodness, how I love you. I am ashamed to say that most of this pickup is actually still in our fridge; we had a really busy week, full of yardwork and Mother’s Day activities, and so for most of the week we subsisted on leftovers and quick-prep food like salads, ramen, fried eggs with couscous, and sandwiches. (I did manage to cut and wash the romaine, thankfully.) On the bright side, the veggies still look great. And tonight is the last pickup of the spring CSA, so we’ve got a bounty of greenery to tide us over during the two-week break between the spring and summer CSA periods. Alas, I really wanted to make more carrot green pesto from the carrot greens, but I think I may have waited too long with these; they were wilted and browning a bit last time I looked at them. Oh well, next time. The flowers were not part of the pickup. Last week was Teacher Appreciation Week, so I picked up this lovely bunch from the East Columbia farmer’s market for the kid’s daycare teachers. 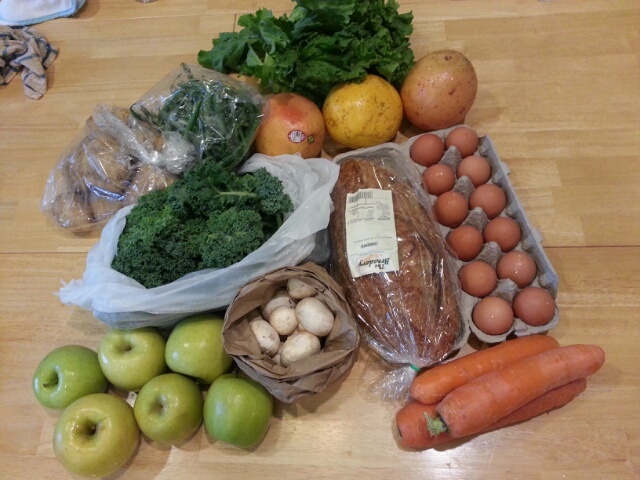 People, go to the farmer’s market at East Columbia on Thursday afternoons! It’s got some of my favorite vendors. I bought a tomato plant from Tomatoes Etc that’s actually supposed to do really well in a container, producing (they said) meaty little tomatoes the size of big grapes. We’ll see how much it likes the conditions on my patio this summer. It’s like I spend my time thinking of very little other than food, what we have, what we need, and what I can do with it, and yet I turn around and find that the food blog has gone neglected for weeks. How does that happen? Man, week 8 really made a beautiful-looking pile on my kitchen table. Three grapefruit, three beets with luxuriant (and tasty!) 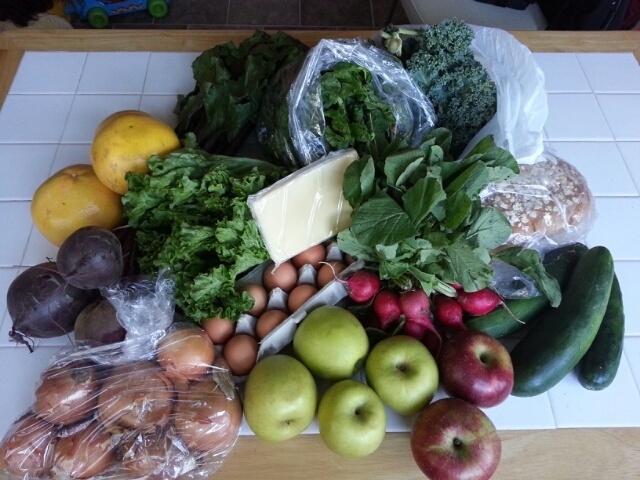 greens, a head of green leaf lettuce, a bag of onions, radishes with their greens (sharp and peppery when cooked; I love radish greens), six apples, three cucumbers, kale, spinach, eggs, bread (Great Harvest oatmeal this time), and this was a bonus week so we also got cheese, a lovely white cheddar. I think we managed to eat everything from this week except the radishes (doing fine in the fridge so far) and one onion. Week 9: even more green leaf lettuce, three grapefruit, green beans, potatoes, more kale, mushrooms, apples, carrots, eggs, and bread (Breadery sourdough). Generally when I see kale and potatoes, I make colcannon almost by reflex, but I think I overloaded my household with colcannon the last time I made it (we were eating leftovers for days). But this was the week that I found out, to my delight, that the kid loves kale chips… both to eat, and to fling into the air like confetti. We had to have a stern talk about that. 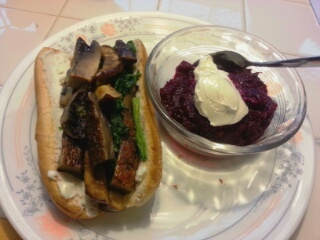 Here’s a quick shot of last week’s meatless Monday meal: sauteed spinach with grilled mushroom and eggplant, tossed with a splash of soy sauce, served on a toasted hot dog bun that’s been spread with a layer of ricotta cheese. On the side: a bowl of chilled beet soup with a dollop of sour cream. We’ve been having more meatless meals these days, almost by accident; when you have this many vegetables to get through, you tend to make very vegetable-centric dishes. Anyway, frozen berries are all well and good, but I can’t wait to try that recipe with strawberries; the strawberry harvest is just around the corner. Right around early-to-mid-May, I start daydreaming about strawberries all the time. It brings an extra bit of joy to spring, which is a delightful season anyway. I love being in sync with the harvest calendar; everything is at its freshest, and you really feel like you’re plugged into the world. Oh, and today is the first day of the market at Miller Library! And then tomorrow there’s the next CSA pickup as well as the market at East Columbia, and then Friday the market at the hospital, and then Saturday the Old Town Market in Ellicott City will start up… I won’t be able to get to all of these, even though I want to, but it’s lovely to be surrounded by so many opportunities for fresh local food.